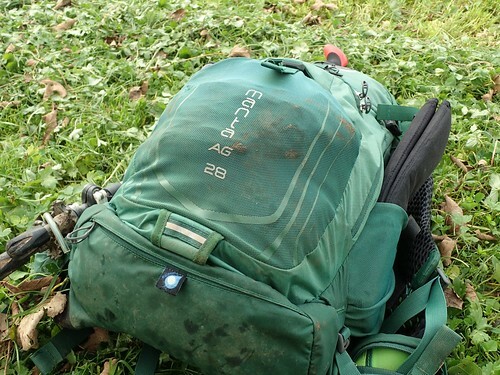 In June last year, I went out to Bristol in search of a new backpack for day-hiking and walked away quite impressed with the Osprey Manta AG 28, which I believe is still stocked exclusively by Cotswold Outdoor in the UK. Over on Olly Writes last summer, I wrote a fairly preliminary review, while still satisfied. But now, almost eighteen-months later, has my opinion of this backpack changed? This entry was posted in Reviews and tagged backpack, Cotswold Outdoor, hiking, hydration bladder, Osprey Europe, Osprey Manta, Osprey Manta AG 28, Osprey Packs, outdoors, review, rucksack, squeak, UK, Walking on 16/10/2017 by Olly Parry-Jones. For the second time this year, I purchased a brand-new pair of hiking boots (shoes, to be specific) from Cotswold Outdoor. My reason for this was simple: I wanted something lightweight for fast-paced, warm weather walks and also, I was curious to test a growing belief that full ankle support isn’t often necessary. So, after around two-hundred miles in my trail-ready shoes, here are my thoughts on the Salomon X Ultra 3 GTX. This entry was posted in Reviews and tagged ankle support, Contagrip, Cotswold Outdoor, durability, GoreTex, hiking boots, hiking shoes, insoles, lightweight, ortholite, Quest 4D 2 GTX, quick lace, review, Salomon, Salomon Quick Lace, Salomon X Ultra 3 GTX, Superfeet Carbon, trail running, trekking, walking shoes, waterproof, weight, X Ultra 3 on 20/09/2017 by Olly Parry-Jones. It’s been almost a month since I wrote a post on my current situation with the walking boots and insoles I own. I had intended to follow it up with another article on the potential replacements for my old ones. In all honesty, I knew all along what I was going to go for. This entry was posted in Walking and tagged Berghaus, Berghaus Supalite, boots splitting, comfort, Cotswold Outdoor, footbed, footwear, hiking, hiking boots, insoles, leather cracking, Salomon, Salomon Quest, Salomon Quest 4 2 GTX, Scarpa, Scarpa Peak, Superfeet, Superfeet Carbon, volume reducer, Walking, walking boots on 19/05/2017 by Olly Parry-Jones. As a frequent hiker who’s attempting to walk one-thousands miles this year, the fit and support offered by my footwear is of great importance. I find myself ready to dip in to the market for a new pair of boots, with long summer walks and The Ridgeway in mind… In this post, I’d like to go over what I currently wear and the various insole and footbed configurations I’ve tried. This entry was posted in Walking and tagged Berghaus Ortholite, Berghaus Supalite II GTX, comfort, Cotswold Outdoor, fatigue, foot pain, footbed, footwear, heel pain, hiking, hiking boots, insoles, leather boots, leather cracking, long big toe, ortholite, Salomon Quest 4D 2 GTX, shoes, Superfeet, Superfeet Carbon, Superfeet Green, support, Taunton Leisure, tongue depressor, volume adjuster, Walking, walking boots on 22/04/2017 by Olly Parry-Jones.